The Vancouver Whitecaps are a pro soccer team, and they are trying to make their stadium AGAP (as green as possible). 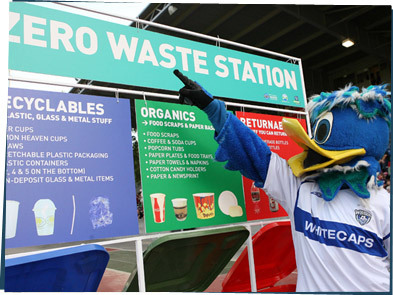 The goal of the Zero Waste Challenge is to get 95% of the garbage made on game days to go somewhere other than the landfill. It's mostly food containers and stuff the fans use, so they're getting fans to help sort trash into Recyclables, Organics, and Returnables. To make it possible, they're switching to recyclable or compostable food containers. Plus they're providing ketchup and that stuff in bulk instead of individual packets which make more trash. Next time you go to a game, look around the stadium and think about what things are being wasted that don't have to be! Now if you'll excuse me, I have to go put away my giant bird costume.